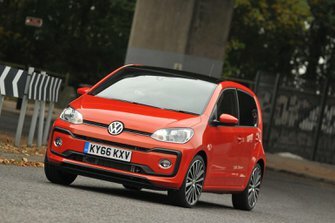 Volkswagen Up Performance, Engine, Ride, Handling | What Car? You can choose from a quartet of 1.0-litre three-cylinder petrol engines: one with 59bhp, another with 74bhp, a turbocharged version with 89bhp and a finally a 113bhp turbo. The two lower-powered engines are a little weedy, so we'd recommend paying for the 89bhp version. It brings much punchier acceleration, particularly at low revs, making the Up far more relaxing to drive and a much more competent out-of-town car. All engines are available in regular or stop-start (S/S) form, the latter of which improves fuel economy and cuts CO2 emissions by switching off the engine whenever you come to a standstill. The 113bhp engine is exclusively offered in the range-topping Up GTI and can propel the tiny car to 62mph in just 8.8sec. There’s also an all-electric version called the e-Up. It feels genuinely nippy around town, although acceleration quickly tails off above 40mph. One of the Up’s main virtues is its supple ride. For such a small car, it does a brilliant job of staying controlled over speed bumps at low speeds and deals well with the sort of broken asphalt and potholes you’re likely to find on your local high street. The ride remains comfortable at high speeds on the motorway and A-roads, where the Up effectively damps expansion joints and stays settled instead of letting them shudder through its body. Put simply, it rides in a much more sophisticated fashion than many of its city car rivals. However, that's only true if you stick with 14in or 15in wheels. Upgrading to 16in ones brings a noticeably firmer ride, while the largest 17in alloys cause the Up to crash and bang over severe bumps. This is where the Up puts rival city cars to shame. 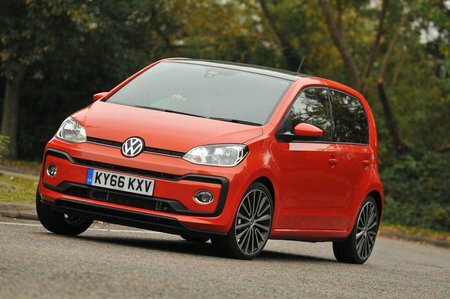 It handles in a much more sophisticated and grown-up fashion than all of its peers apart from the Kia Picanto. The precise steering is light enough to make low-speed manoeuvres easy work, but weights up enough as you turn the wheel to give you lots of confidence along faster, twisting roads. Throw in a decent amount of grip and surprisingly tidy body control (the Up doesn't tip over onto its door handles through tight corners like some rivals) and you end up with a car that’s genuinely fun to drive. Having said that, the Up isn't blessed with the microscopic turning circle of the Renault Twingo and Smart Forfour. The stiffer GTI model is, unsurprisingly, more agile than regular versions of the Up. You can read more about that version here. All of the Up's engines have three cylinders, so none of them is quite as smooth as the four-cylinder units in the Picanto 1.25 and Hyundai i10 1.2. You notice a few more vibrations through the soles of your feet when accelerating. 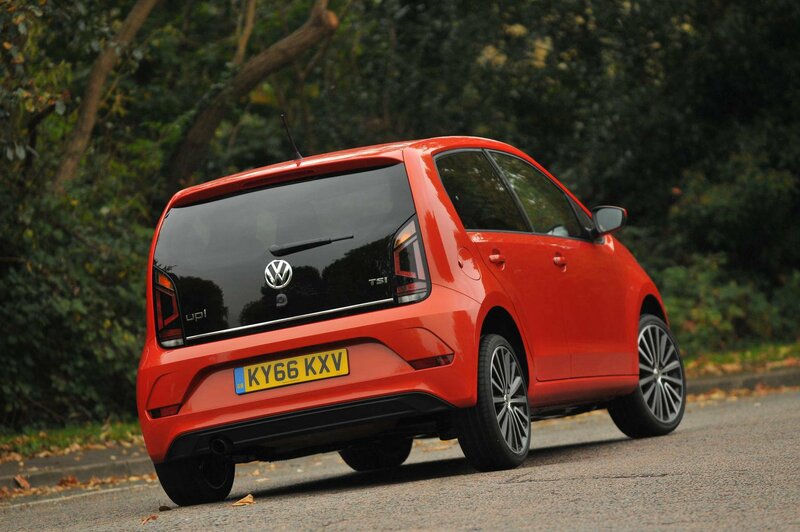 Still, all three engines in the standard Up are relatively hushed – particularly the turbocharged 1.0 TSI 90. The Up’s feelsome clutch pedal and light-but-precise manual gearchange also impress. However, we'd avoid the optional automatic ASG gearbox; it's very jerky and slow to respond when you ask for a quick spurt of acceleration. There’s also a mite too much wind and road noise at motorway speeds. An i10, for example, is a slightly quieter cruiser.